Ocasio-Cortez is the brash congressional newcomer who knows how to spark a national conversation. She’s been focusing on income inequality, a worthwhile discussion at a time when the income gap has widened and as low- and middle-wage workers have experienced little improvement in real wages over the past few decades. But she is sometimes fast and loose with her facts. There are a torrent of claims in the statement above, worthy of further scrutiny. We’re not really that nit-picky, are we? Let’s explore. We are going to break down her statement into parts. The question is whether a “vast majority” of American workers do not make a living wage, as Ocasio-Cortez claims. The answer is not easily found. The living wage is not really a measure of income but of living costs, before taxes, such as food, child care, housing, transportation and other basic necessities; it does not include meals in restaurants, entertainment or vacations. It is often misreported as an income figure, but it cannot be easily compared to income such as a minimum wage — even though it is. There are several versions of the Living Wage calculator, which all focus on the costs in a particular locality. There are wide variations, and so a nationwide average does not really capture that. The MIT Living Wage calculator, run by Amy Glasmeier, a professor of economic geography and regional planning, says the living wage in the United States was $16.07 per hour in 2017, before taxes, for a family of four (two working adults, two children). That means both adults together would need to make at least $32.14 before taxes to cover basic necessities. “We do not say that a majority of Americans don’t make enough income to cover basic costs,” Glasmeier said. But she added that it is challenging to come up with an estimate. Her spokesman also pointed us to Social Security Administration data that shows that 54 percent of wage earners received wages of less than $35,000, — a figure that contains part-time workers. 67.7 percent of full-time workers earn at least $16.07 per hour. 61.9 percent of all workers (i.e., full-time and part-time) earn $16.07 per hour or more. The median hourly wage for full-time workers is $21 per hour, and the median hourly wage for all workers is $19.60 per hour. Ocasio-Cortez is on the mark — and even undersold the number. “A single-mother with two children earning the federal minimum wage of $7.25 per hour needs to work 135 hours per week, nearly the equivalent of working 24 hours per day for 6 days, to earn a living wage,” according to the MIT calculator. As of Nov. 1, Amazon pays at least $15 an hour to its hourly workers — even more in other places — and, in fact, supports efforts to raise the minimum wage. When Amazon made the announcement that it was raising wages, it even earned kudos from a longtime critic, Sen. Bernie Sanders (I-Vt.). At Walmart, entry-level workers earn at least $11. Total compensation for those workers, including benefits, a discount on Walmart purchases, health care and 401(k) contributions bring that figure to $17.50 an hour, according to Walmart spokesman Kory Lundberg. Ocasio-Cortez’s office did not address her flub on the minimum wage, but to defend her comment about a wealth transfer, her spokesman supplied a Washington Post article about a proposal by Sanders that would require large employers such as Amazon and Walmart to fully cover the cost of food stamps, public housing, Medicaid and other federal assistance received by their employees. The article cited a report that as many as 1 in 3 Amazon employees in Arizona — and about 1 in 10 in Pennsylvania and Ohio — receive food stamps. The companies say the figures are misleading and reflect the fact that either the employees are choosing to work part time or that the entry-level workers may have been on public assistance when they first started. “We think we help move more people off public assistance than any company out there,” Lundberg said. Even if Ocasio-Cortez were right about the minimum wage, her contention that those companies are benefiting from a wealth transfer is dubious. The standard incidence analysis used by the Congressional Budget Office, Joint Committee on Taxation and other researchers generally assumes all costs and benefits of labor-related taxes and benefits are borne by labor — i.e., the worker, not the employer. So wages would be largely unaffected if taxes went up or public assistance went up. And the worker would still get paid the same, even if they had to carry the burden of new taxes or received enhanced benefits. Ocasio-Cortez deserves credit for using her high profile to bring attention to income inequality. However, she undermines her message when she plays fast and loose with statistics. A lot of Americans do not earn enough for a living wage, but we cannot find evidence that it is the “vast majority." Amazon and Walmart pay well above the minimum wage, contrary to her statement, and it is tendentious to claim those companies specifically get some sort of a wealth transfer from the public when such benefits flow to all low-wage workers in many companies. 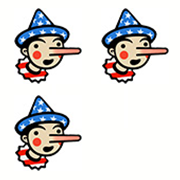 Overall, she earns Three Pinocchios.